Another fine play at the Ramsdell Theatre. 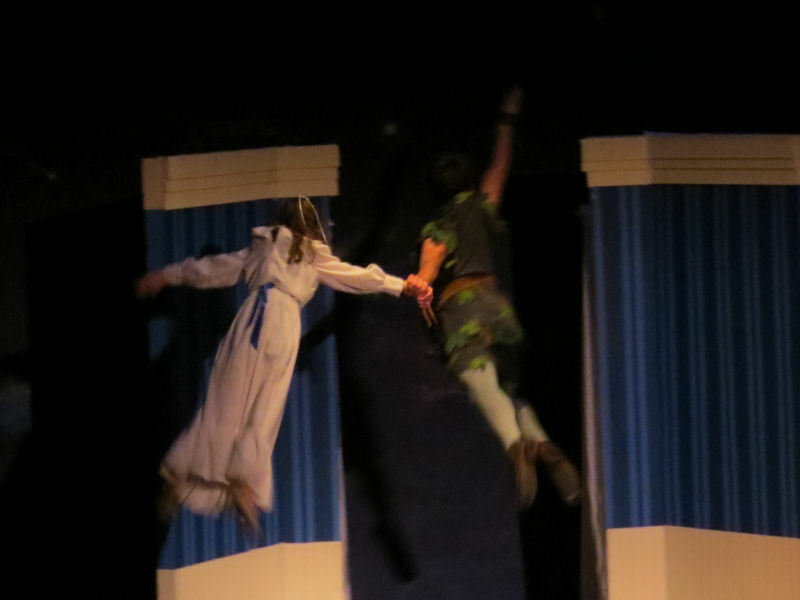 This was the classic Peter Pan. The cast was young. Except for some of the pirates and Mrs. Darling, the rest of the cast were children through college students. They put on an excellent performance. 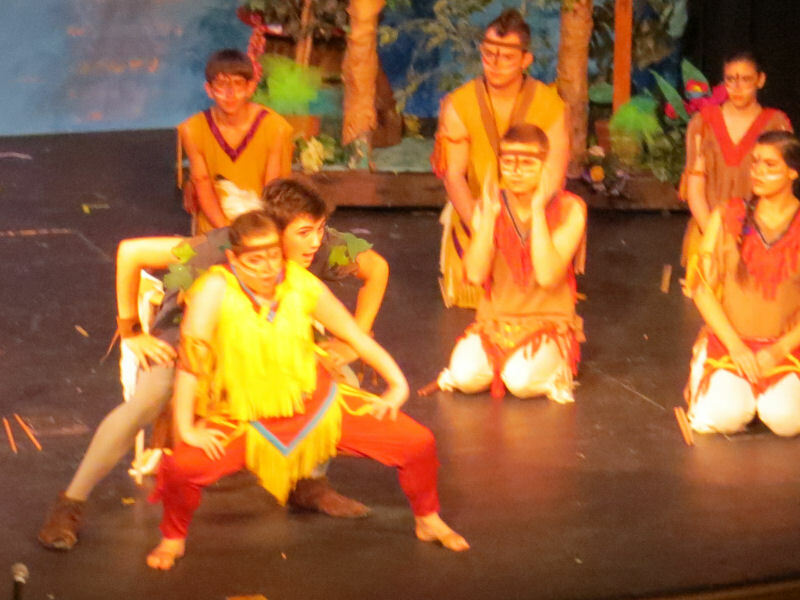 The children did a good job of staying in character, so they didn't seem like children acting, but like "lost boys," Indians, Wendy, John and Michael, etc. Mr. Darling/Captain Hook was a college student, as was Peter Pan. The set was uncomplicated and practical, yet it gave enough elements to help the audience imagine the scenes. 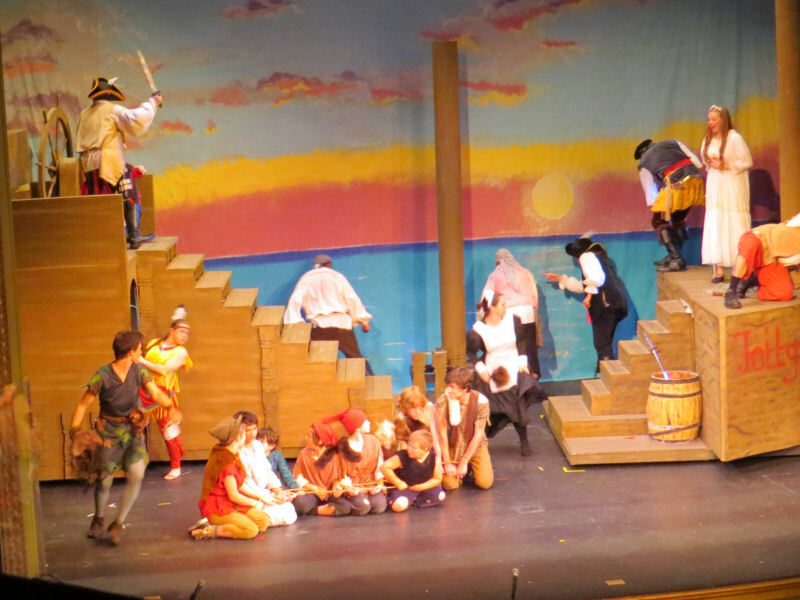 One technical issue the cast had to deal with was caused by another technical challenge. Most productions nowadays depend on wireless microphones instead of voice projection. It was announced before the play that the flying apparatus (the wires?) 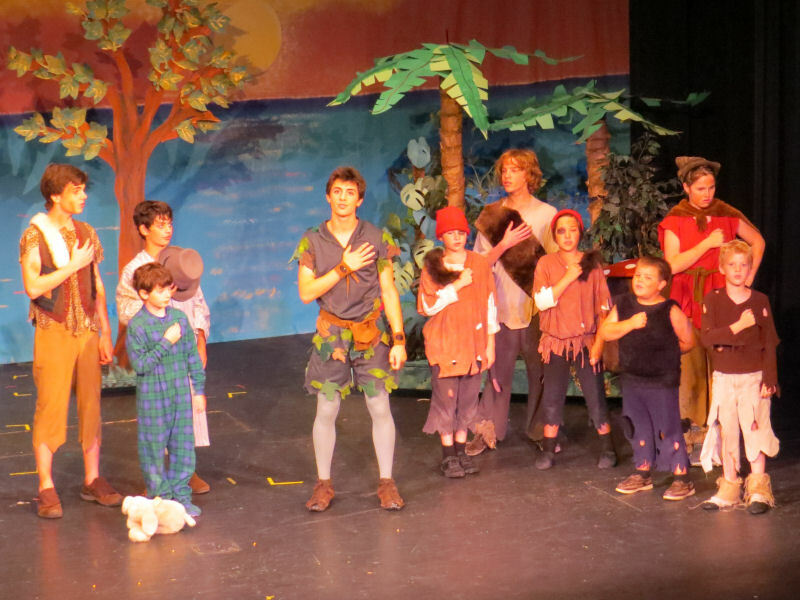 made it impossible to use the mics, so the cast had worked hard on projection, and we'd need to listen closely. I think everyone did a good job with this, although since I pretty much know the play by heart I wasn't struggling for the words. The lighting was good enough for viewing, but not quite enough for really good candid photos. I didn't get a single one of Peter flying that was focused well. 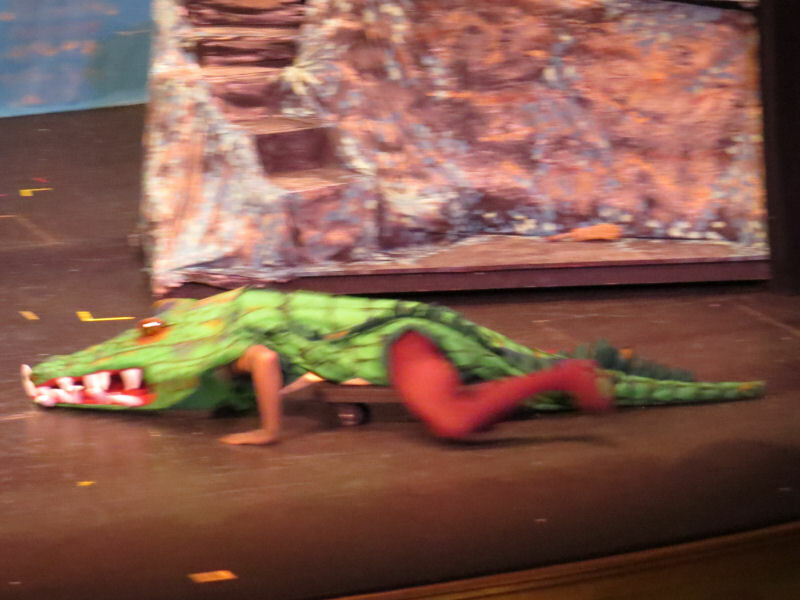 It's too bad, because he was quite acrobatic and did cartwheels and nicely controlled entrances and exits. I'm posting a few pictures here, and will put more on Facebook tomorrow. I'll just send for Tiger Lily. 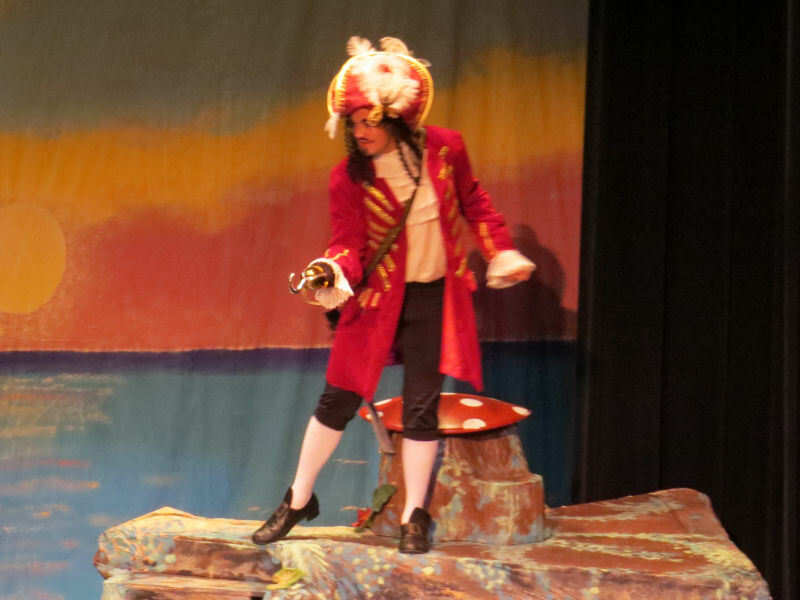 The crocodile comes for Captain Hook! 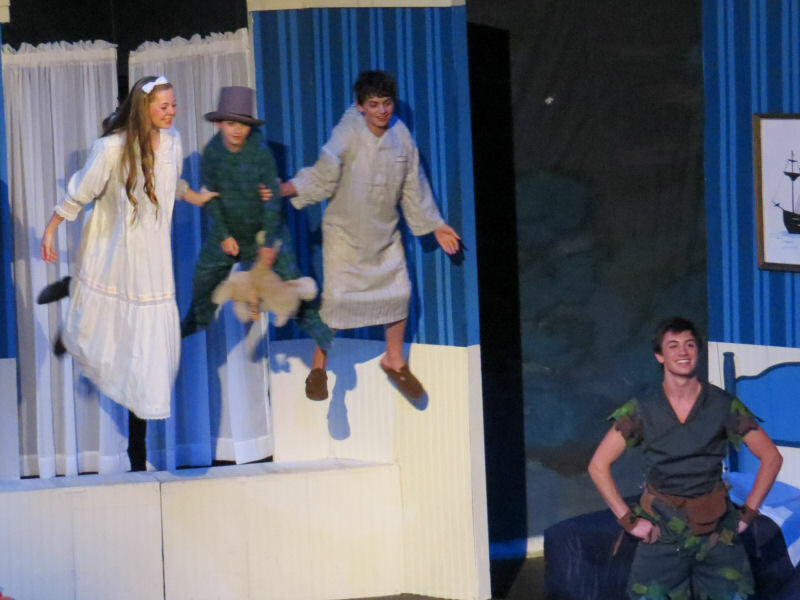 The fickle Peter takes Jane to Never Never Land when he learns that Wendy has grown up. OK. I've had one hour of sleep since 6:30 yesterday morning. I'll tell you a little bit about this weekend and then I'm going to bed. We were debriefed after dinner this evening, and given guidelines on what we can share. Sorry that the link to the news story didn't work yesterday. I think I've fixed that. The lack of sleep is only because I had to work last night- not because of the forensic project. 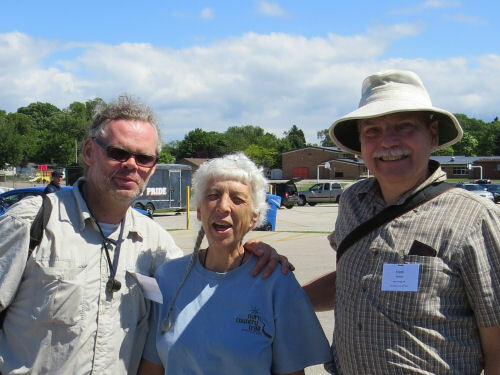 Here I am with Matt of the Field Museum of Chicago and Frank from Michigan State, both PhDs and experts in various plant fields. The story in brief- two years ago a 4-month old baby was taken by her father in the midst of dispute with the mother. Three hours later the father showed up without the now infamous "Baby Kate." She has never been found. The father is currently serving a sentence for criminal confinement, but the police would like to be able to charge him with murder. But what everyone really wants is just to know the truth about "what happened to Baby Kate." There are only a couple of exact locations the father was known to be in those three hours. However, as part of the evidence collected from his shoes the police thought they would try to match local soil types. It turned out there were fragments from nine different plants on his shoes that were much more interesting than the soil. Here's where it gets like a TV show. It would be very unusual for all nine of those plants to grow in the same place. One of the sedges likes acid soil and another alkaline. There were three types of moss on the list. Two are acid-lovers and the third is rather rare. So began a process whereby a number of experts volunteered more time to suggest places in the county where acid/alkaline margins might be identified. These were the locations we searched. We are not supposed to disclose those exact locations. We were searching for these nine species of plants, with an emphasis on the six most unusual. We also aren't supposed to speculate on findings from the weekend. But, obviously, the grids where we did not find the key six will have a lower priority for further investigation. Also, the police explained that the plants are only some of 14 pieces of information they have about where the father went. Slowly but surely they are narrowing down the possible places he could have been to in the missing three hours. The two days were an amazing collaboration of law enforcement personnel. City police, the Sheriff's Department, State Police, Department of Corrections, the National Forest Service, almost all the county fire departments (almost all volunteer) had roles. The Salvation Army and Red Cross provided food and EMT support. 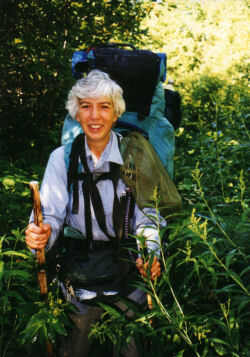 Local churches provided vans and drivers to transport the botanical volunteers. (We did have to apply to be one of the searchers, and I don't know how many applicants there were, but I know that a number of people were not accepted. The people who came were from all over the state, and even farther away.) The whole event was coordinated logistically by Mason County Emergency Management. I may have more to say about the plants another day. 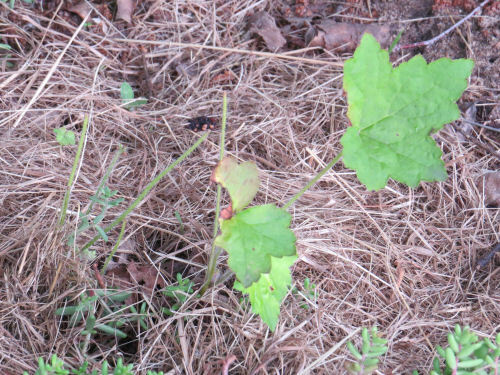 It was totally awesome and the plant species have been released to the media so we are allowed to share. We could not take pictures on these two days, but I asked, and they don't care if I return to the sites and do some personal botanizing, as long as I don't disclose the exact locations. I learned SO much. Made new friends. Had a blast. Maybe made a difference. I am tired but completely satisfied. No, the title is not a joke. We are not allowed to say much about it, but today was one of the most awesome in my recent memory. 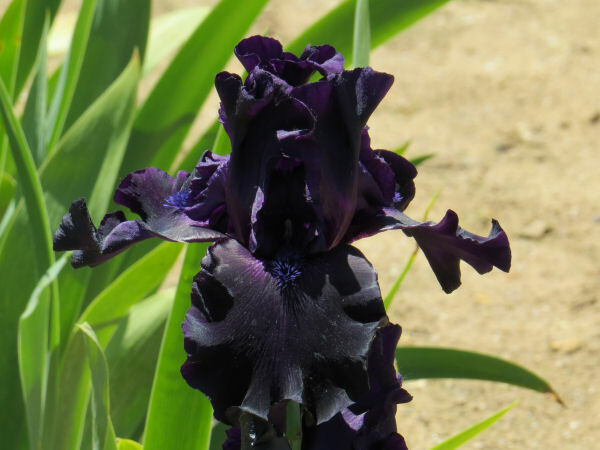 I participated in a botanical search with a forensic purpose. Now I'm getting ready to go work all night, and then do botany all day again tomorrow. We weren't allowed to take any pictures at all. When I was out doing assignments yesterday, I saw this moth on someone's house. I had no idea what it was! 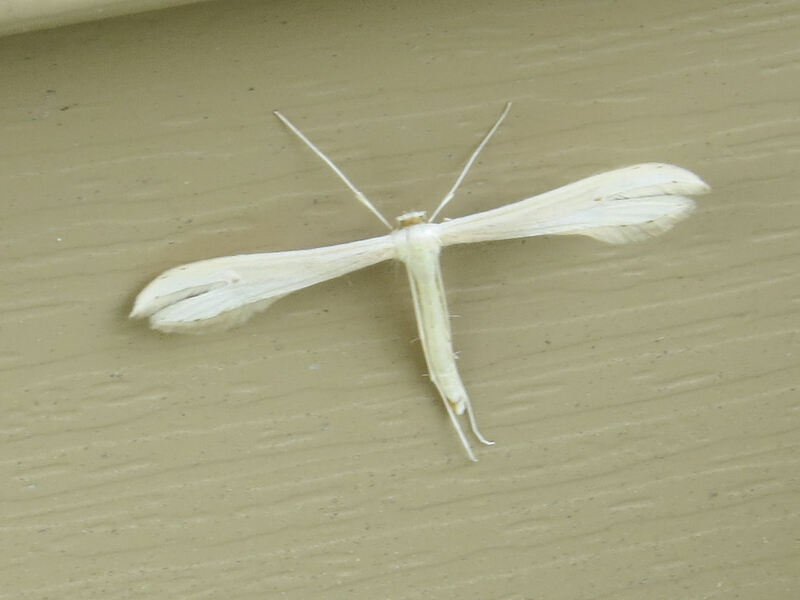 But thanks to the internet, I quickly learned it is a plume moth, in the family Pterophoridae. This is completely new to me. But on Bugguide.net there are quite a few of these- white, brown and mottled ones. If they spread their wings they are somewhat ragged, looking almost like feathers. I wish I would have poked it to see if it would flutter or something. I think they look like little twigs that somehow sprouted wings. Now I want to find more! OK, if we are doing the restaurant, I've added a condiment for tomorrow. A lot of black pepper. What do you think? Does this visitor have a guilty look in his eye? Found hanging around the general region of the crime. I'm actually pretty unhappy. 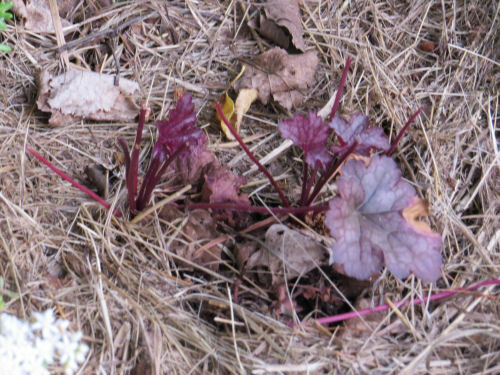 Those were plants I paid money for, and with the hostas mostly chewed off by the deer, I had hopes that the Heucheras (coral bells) would look nice. I see that I showed this shrub two years ago, but these are better pictures, and it's still one of my favorites, so I don't think you'll mind a repeat. 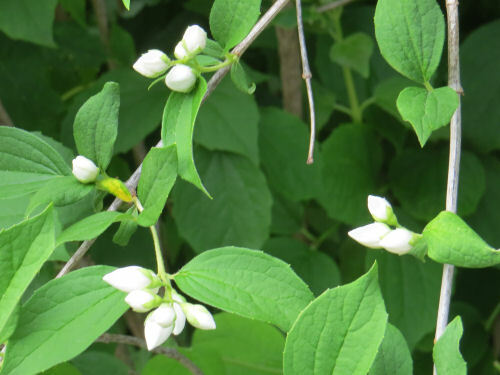 The basic shrub is very old-fashioned, but there are new cultivars with larger blooms. 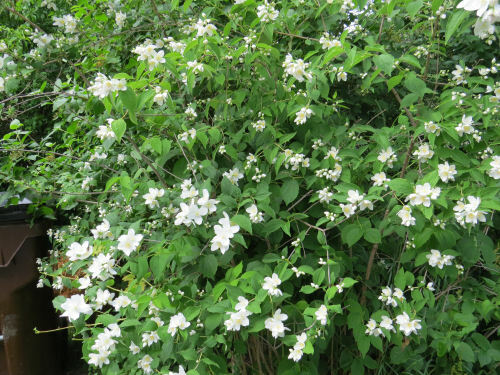 I think this is one of the cultivars, maybe Philadelphus coronarius. 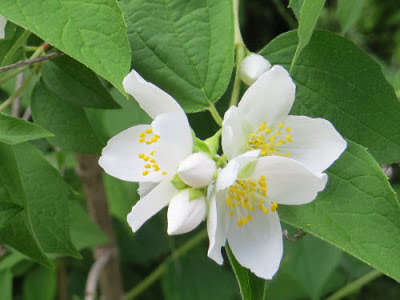 The traditional one is Philadelphus virginalus. Even the buds on this are beautiful. 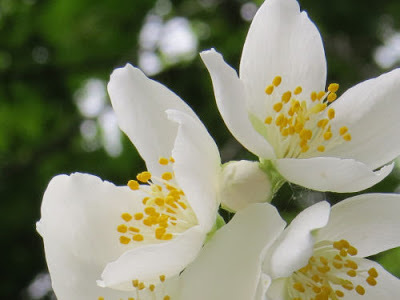 We had one in our yard when I was a child, and it was my favorite of the flowering shrubs. The scent is perfect, to my way of thinking. Sweet but not cloying, with just a hint of citrus-y spice. I would love to have one again. This time I looked up where it fits in the taxonomic world. It's actually related to the Hydrangeas. Who knew?! I would have guessed Rose family, but then I was reminded when I saw it that it only has four petals, so that would be unlikely. Even though most everything here is blooming late this year, I see from my previous post that it was blooming on June 20th, 2011. So that's just about the same timing. 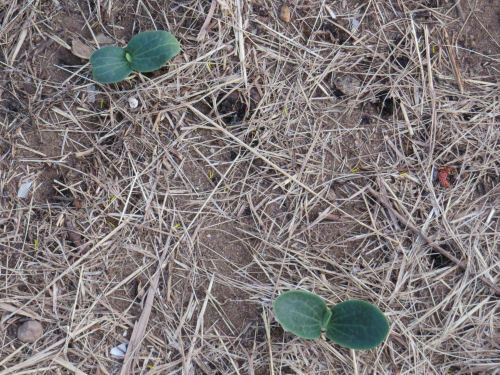 I guess these pumpkin plants are destined to be mine. They took just about as long as possible to sprout. Procrastinators of the world, unite! I planted five seeds and only two came up. That means they won't need thinning. Seems a little odd since the weather has been as close to ideal for growing things as possible, and I watered the site regularly, and the soil was amended with compost last fall. Anyway! If I can keep them from all the critters with teeth there is a lot of potential here. I took the next-to-last slice of whole wheat pumpkin bread out of the freezer for dinner tonight, so I have high hopes. And I knew I had showed you pumpkin pies before. Don't know why I couldn't find those posts last time. See Pi(e) is a Relationship. Just when I think I've seen all the color variations on the scene from my deck and my office window, a new one appears. 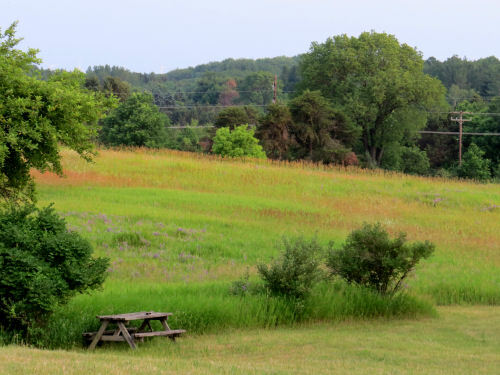 Today, in the late evening light, the weeds and the grasses all seemed to glow with individual colors, instead of just being a green field. 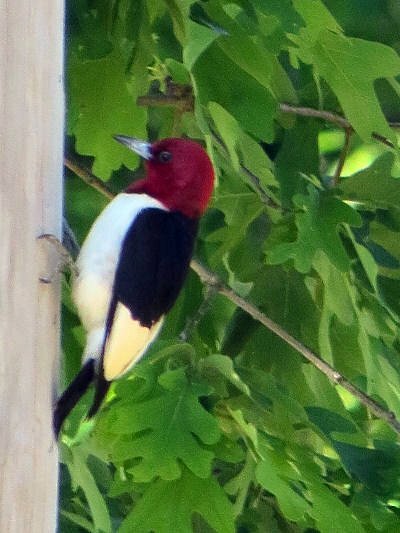 Almost every time I go to Idlewild, Michigan I see a red-headed woodpecker, Melanerpes erythrocephalus. They aren't rare, but I never seem to see them really close to where I live. This is my third try at getting a decent picture, and it's the best one yet, although still not really good. The distance is always so far that I have to use the digital zoom as well as the optical one, which makes for fuzzy pictures. I love the bold blocks of color on these birds. 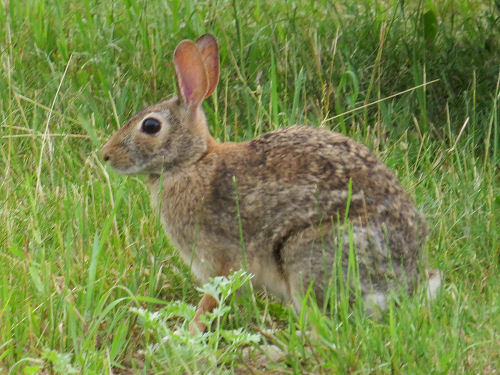 I'm probably also partial to them because they were common on our farm when I was a child. Just in time for the summer solstice, I think we've finally made it to real summer here in Michigan. It's been a gorgeous week with temps in the 70s, low humidity and gentle breezes. It's supposed to rain some this weekend, and that would be good. The rain is a critical part of the green-ness. 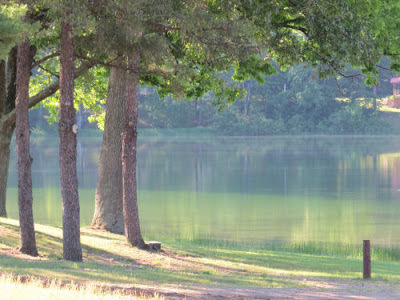 This is Idlewild Lake in the morning light. 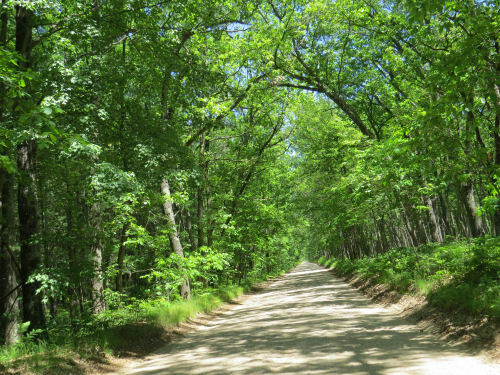 My back roads are looking more like tunnels- so cool and inviting. 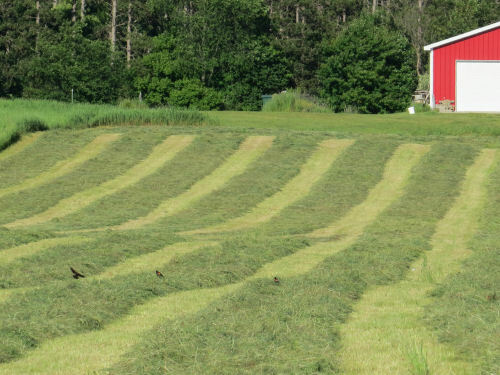 And of course, the first cutting of hay is ripening in rows, waiting for the balers. I'm off for a night of work at the paper. I would love summer if it were always like this week! Too tired to do a very detailed post. Loretta and I took a nice walk this morning around Idlewild Lake. 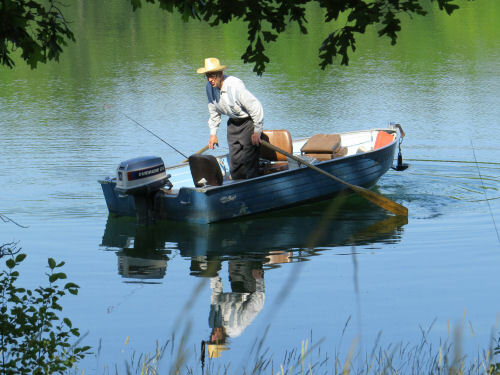 This gentleman was spending a lovely summer morning doing a little fishing. I wonder if he has responsibilities waiting him later, or if he can fill his days with activities he likes. At any rate, I thought his rowing technique was interesting, and the reflection just about perfect. This nearly invisible flamingo was just hangin' around in the woods near a cabin wondering why it was he ate such a huge meal. Maybe that's why they stand still- don't want to disturb the digestive progress. 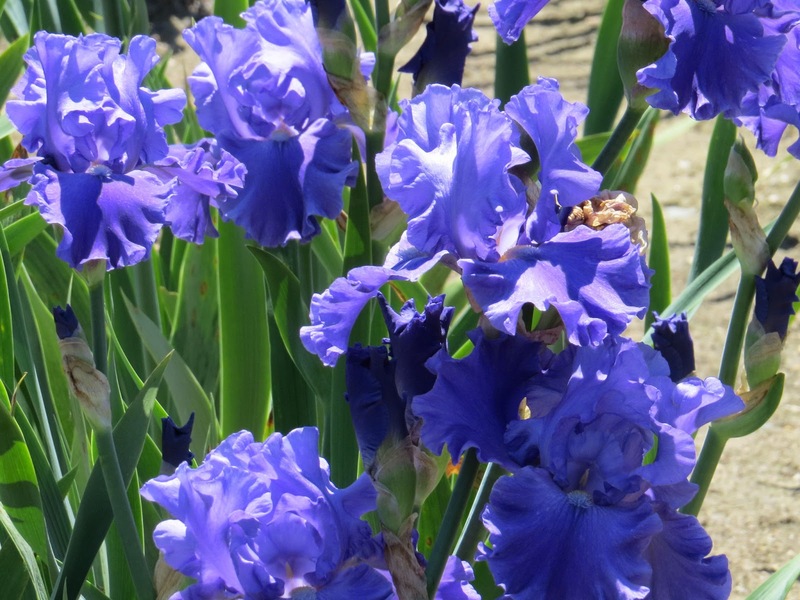 Loretta and I went to the Leelanau Iris Farm near Traverse City today. I've been wanting to go there, but never seem to get around to it. 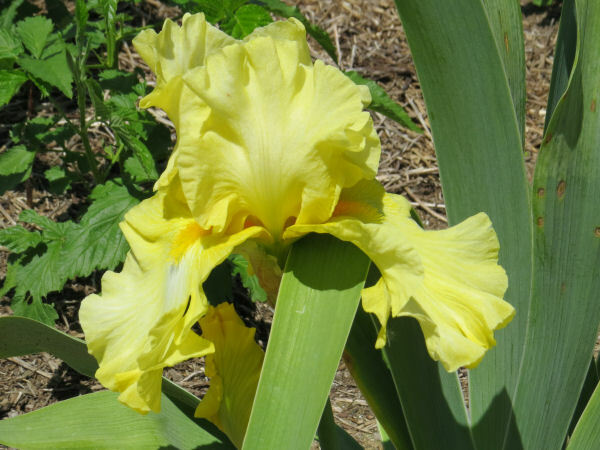 There were acres, ACRES, of iris all blooming. 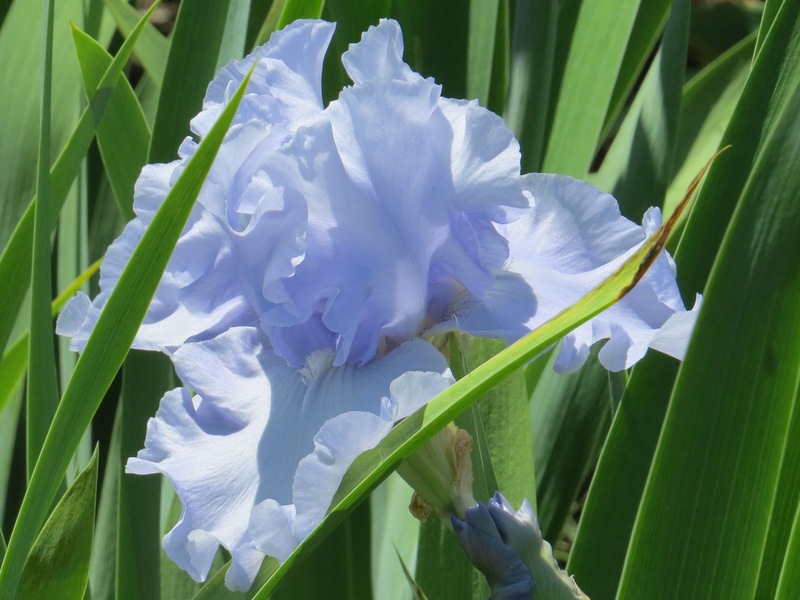 The idea is that you can look at the labeled plants and then order ones you like, which will be shipped at the right time of year. I didn't order any, although I might be tempted in the future (need to reclaim my flower beds). But we sure had a great time. I don't think I can pick! I'll probably just hope that the ones I do have are still alive. 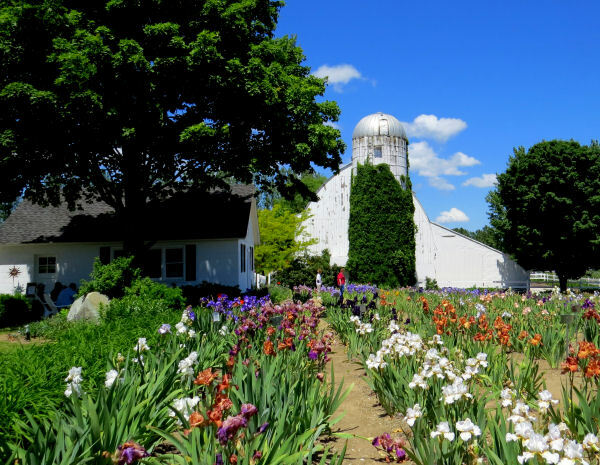 Stay tuned for more flower garden news.